In a friendly reminder that iPhone is the world's most popular digital camera, Apple on Monday added eight new user videos to its "Shot on iPhone" series, highlighting the handset's ability to capture high-quality footage in the most challenging environments. As usual, each user-sourced 15-second clip spotlights a unique iPhone camera feature —most taking advantage of dramatic slo-mo footage —with onscreen action synced to an accompanying backing track. The first video is plays like a live-action homage to Murad Osmann's "Follow Me" Instagram series in which his girlfriend leads him by the hand through some of the world's most iconic destinations. Shot at sunset, iPhone was able to accurately render both the amber sky and low contrast areas woman's back. Bonus: lens flare. Apple's second selection takes advantage of iPhone's high frame rate recording capabilities to slow down a swarm of bees mid-flight. Here, iPhone's shooter is able to capture both specular and silhouette highlights as the bees crisscross in front of the sun. Next up is a video of four young boys jumping into slightly rippling water. Color information was removed to create a black-and-white effect, and the camera operator chose to render the final product in reverse. The resulting composition draws the eye to an interesting juxtaposition of natural shapes and the sharp, skeleton-like structure in the background. Apple again touts iPhone's imaging accuracy with its next selection. An aerial shot taken above the clouds, iPhone is able to balance the hard, bright highlights that make up a majority of the composition with soft tufts of cloud seen in low-contrast dark areas of the image. A dash of pink can be seen in the distance. 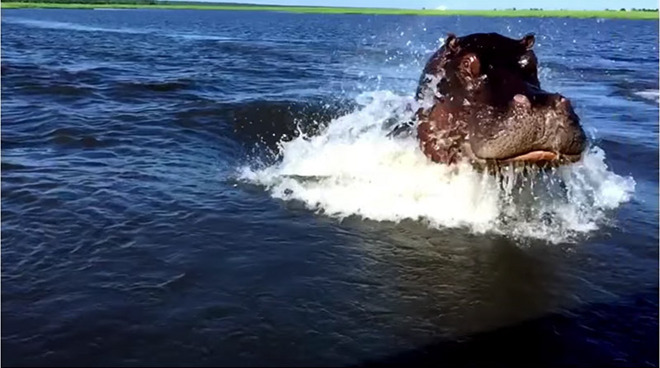 The next video shows a hippo stalking a small boat and breaching just shy of the kill. The clip switches to slo-mo for dramatic effect. Shot in a 50/50 split horizon perspective, the sixth video focuses on a dog running in slow motion through tall foliage. This particular shot reveals iPhone's lens group, which is able to extend depth of field with small aperture shooting, while maintaining high color saturation and brightness. Another fun clip shows a time-lapse of penguins waddling around a frozen landscape. Apple went with an artsy clip to round out its latest batch of "Shot on iPhone" videos. Another slo-mo snippet, the final video portrays the fluid dynamics of a rain-speckled windshield being cleared by a windshield wiper, set to some moody music.